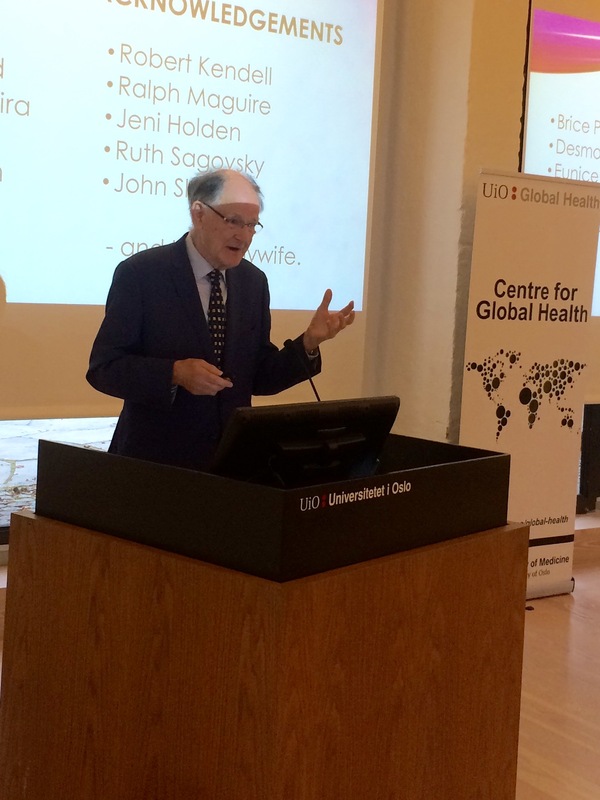 Report from Global Mental Health Day 28th November 2018 at Professorboligen, this year a special focus on perinatal mental health. The seminar was moderated by Dr Suraj Thapa, Professor of Clinical Psychiatry. Dr Thapa introduced Professor Ganesh Acharya, head of Obstetrics and Gynaecology, Karolinska Institute. Professor Acharya highlighted that perinatal depression and psychosis were relatively underdiagnosed compared to complication such as pre-eclampsia, preterm labour, post-partum bleeding, or sepsis. Currently, one in five women develop perinatal mental issues, and one in eight partners will be affected. Prevalence in high income countries is estimated at 13%, and higher still in low and middle income countries (LMICs) at 20%, and up to 42% among immigrant populations. Measurement of cases is complicated by the lack of defined, standard outcomes. Risk factors include prior mental health issues, education level, stress, or lack of social support. Symptoms can include low mood, anxiety, substance abuse, post-traumatic stress, or psychosis. Mental health disorders are stigmatised, both by patients and health care workers alike, resulting in under-diagnosis. Health workers lack a simple, sensitive and reliable screening test, while many tests are in use. Comprehensive assessments require a long interview, which may be insufficient to diagnose perinatal depression if carried out only once. Management options are available, such as counselling, cognitive or pharmacotherapy. Professor Emeritus John Cox presented a reflection on the Edinburgh Perinatal Depression scale (EPDS) that he developed in 1987 alongside Jenifer Holden and Ruth Sagovsky. Women are asked to report on indicators such as laughter, optimism, self-blame, coping with daily living, sleeplessness, sadness, crying, or thoughts about suicide. The questionnaire has been in use for thirty years and translated into over sixty languages. In 2017, Cox published an article outlining the optimal use of the survey, emphasising caution when interpreting or applying cut off scores in different contexts. Cox drew attention to the Lancet Commission on global mental health and sustainable development, published in October 2018, which recognises the importance of mental health, and provides a call for action. Dr Signe Dørheim, a perinatal psychiatrist, described research on maternal depression in LMICs. Depression in mothers can lead to early birth and lower cognitive and social development of the child. In LMICs, women face high exposure to risk factors such as poverty, violence, insecurity, such that perinatal depression is more common. In Nepal, suicide was the most common cause of maternal death in 2008. First time mothers face a 2-3 times higher risk, with more cases occurring in the first five months postpartum. Dr Dørheim presented results from research in Nepal, identifying alcoholism, polygamy, domestic violence, and son preference as risk factors– all common to LMICs. Protective traditions included returning to the maternal home after giving birth. Professor Nora Sveaass is professor in Psychology at UiO focussing on sexual and gender based violence (SGBV). Prof. Sveaass developed the manual ‘Mental Health and Gender Based Violence: Helping survivors of sexual violence in conflict’ together with a team of clinicians. The manual equips the survivor with tools to manage psychological reactions to trauma. The manual aims to expanding survivors’ tolerance to stressors, and thereby enjoy better quality of life through techniques such as acknowledgement, stabilisation, safe spaces, and psycho-educational approaches. Professor Johanne Sundby from UiO presented her research access to maternal and reproductive care in conflict settings. Exposure to SGBV is exacerbated by conflict and displacement. Humanitarian maternal health services do not include mental health services. Challenges to screening include access to skilled professionals, and how to targeting mobile, linguistically diverse populations. Available interventions include individual or group therapy, outreach using mobile technology or social network strengthening. 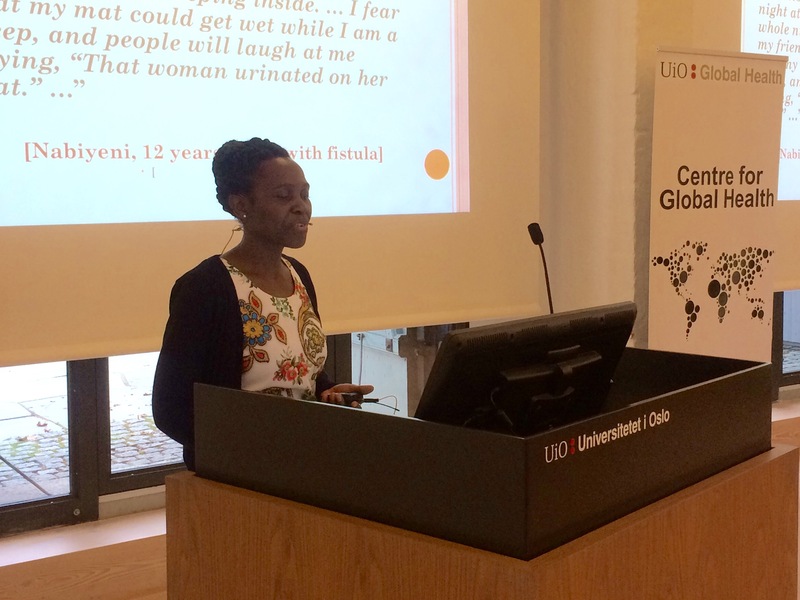 Doctoral candidate Josephine Changole presented her research on survivors on obstetric fistula in Malawi. This condition results from delays in reaching obstetric care when giving birth. Around two million women suffer from obstetric fistula worldwide, with up to 100,000 new cases each year. Women experience leaking urine or faeces, nerve damage, in addition to discrimination through social and economic exclusion or divorce, resulting in anger, grief, anxiety and sadness. Fistula surgery is available, yet demand for specialised surgeons outstrips availability. Interviews with survivors highlighted delays in accessing medical care, the need for surgical treatment and psychological support. Dr Andrea Solnes Miltenburg discussed her research on discrimination and abuse in maternity care in Tanzania. The study revealed psychological or physical abuse. Mothers faced aggressive language, ridicule, threats to withhold care, refusal of services or even abandonment during birth. Most experienced breaches of privacy, some experienced of non-consented episiotomy or HIV testing. Physical abuse included forced vaginal examination, or restraining the mother. Root causes include the low status of women in society, and limited investments in midwifery education. We would like to thank all our speakers for their stellar presentations, our moderators Dr Suraj Thapa and Dr. Ann Færden. Collins et al. Arch Womens Mental Health 2011;14:3–11.